Kaitlin Whitehorn had quite the end of her 2016 outdoor season. 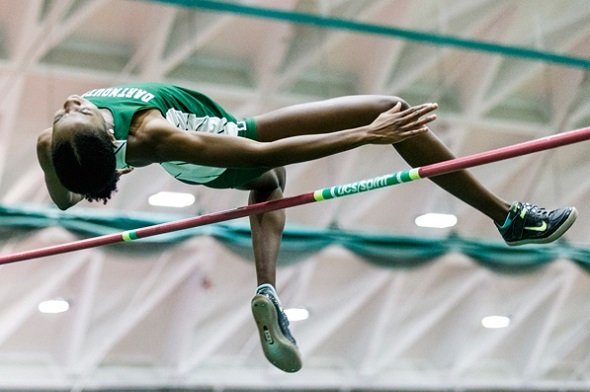 In the finals of the women’s high jump, Whitehorn showed that she was the top collegian jumper in the field. She cleared the first two heights – 5-10 1/2 and 6-00 1/2 – on her first attempts. But those heights were familiar territory for the Big Green graduate. The next height was 6-02 1/4. Ten athletes made it to that height. But Whitehorn was only one of three to clear it on her first try. This height was a new lifetime best by almost 2 inches. Had this been inside the regular NCAA season, it would be the third best performance for a Heps athlete. Unfortunately, she could not make the next height of 6-03 1/4. She finished fifth in the competition. Chaunte Lowe won the competition by clearing 6-07, while recent high schooler-turned-pro Vashti Cunningham finished second with 6-05 1/2 and Inika McPherson was third with 6-04. Whitehorn was our only HepsNation athlete to compete today, but there will be plenty of action tomorrow. This entry was posted on Sunday, July 3rd, 2016 at 7:05 pm. It is filed under Olympics, Spotlight. You can follow any responses to this entry through the RSS 2.0 feed.